The Ecosystems Center staff includes scientists, research and lab assistants, administrators, post-doctoral researchers, and interns. The Ecosystem Center’s scientists are usually hired first as a post-doctoral researcher. Grants from US National Science Foundation provide the majority of funding for research projects and salaries at the Ecosystems Center. Other public and private organizations, such as the US Department of Energy and A. W. Mellon Foundation, have also financially supported the Ecosystems Center. Undergraduate and graduate education is a longstanding component of Ecosystems Center. In the early years of the Ecosystems Center, scientists ran a four-week January Course in Ecology for undergraduate and graduate students, a six to twelve-week Summer Course in Ecology, and a Year in Science program for graduate students. Later, some of those programs ended, but the Ecosystems Center offered student internships. In the fall of 1997 the Semester in Environmental Science program began. This program recruited undergraduate students from small colleges in the US, engaging these students in an intensive program in ecosystems ecology. The Ecosystems Center also partnered with the Woods Hole Oceanographic Institute, Boston University, and Yale University to have graduate students to work with Ecosystems Center researchers. Scientists at the Ecosystems Center have contributed to both national and local environmental policy issues. In the late 1970s and early ‘80s, George Woodwell and Robert Howarth were especially involved in policy debates about the carbon dioxide problem and offshore oil drilling. They testified to congress and federal agencies, consulted for non-profit organizations, and served on committees. Locally, scientists involved themselves in issues of coastal environmental issues, such as the impact of fertilizers and wastewater on coastal ecosystems. Many of the Ecosystems Center scientists have participated in local environmental management boards and hearings. Other notable national and international activities of the Ecosystems Center scientists include participating in international research synthesis projects and serving for federal appointments. Jerry Melillo organized a meeting at the MBL of the some of the Intergovernmental Panel on Climate Change authors in 1989. Melillo also held various appointments with the US National Science Foundation and Office of Science and Technology Policy. John Hobbie was involved in the US Arctic Research Commission and the National Research Council’s Polar Research Board. These are just a few examples of how Ecosystems Center scientists have participated in national environmental and science policy issues. 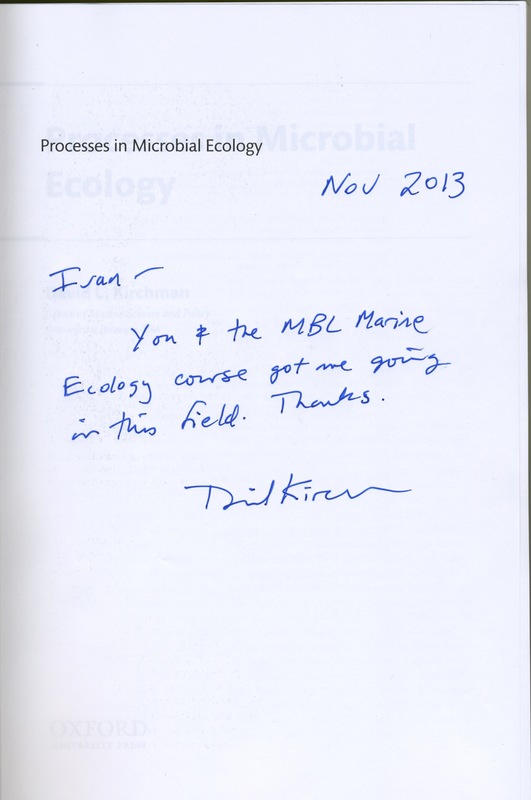 Title page of the book "Processes in Microbial Ecology"